Thanks for the encouragement to start the Ravelry group. It is up and running. I am looking forward to learning a lot from the group members. I’d love to have input for improving my patterns so that they are usable for all skill levels. My next step is to gather all my free patterns that are wondering around in what my sister calls “the black hole of the world wide web.” I’ll put them on Ravelry so folks can download them to try out. That way they won’t be buying a pig in a poke if they purchase one of my PDFs. it was the best conversation that you ever had. A friend suggested that I start a group on Ravelry since I’m formatting patterns to sell online as PDF files. Apparently a number of designers have groups. The idea was that I could answer questions, clarify instructions, gather suggestions and share the tidbits that I share when I’m teaching a class. When I investigated the process of setting up a Ravelry group, I discovered that I need to list three people to invite to join the group. Therein lies my first quandary. What if I listed someone who didn’t want to join the group but didn’t want to hurt my feelings by saying, “No”? Bottom line, I’m exploding with ideas and would love to share them with someone. What do you think about the group idea? Kim Kulasa, member of the Dayton Knitting Guild, emailed a photo (upper left) to me of the shawl she’d finished using a pattern I designed. She showed the shawl at the guild meeting and inspired Mary Habeeb to knit one. Mary is proprietor of A Good Yarn in Greenwood, Indiana and produces dyed yarn, fibers, handspun and knitted items. The original Mouse Tracks Shawl is shown below as I blocked it. It features Russian-style lace at the neck and lower edges, a neck scarf closure, and shaping. The neck edge curves gently to lie flat. The depth widens so that the shawl extends down the back to the waist. I plan to sell this pattern online as soon as I finish another shawl using red alpaca. It will photograph with more definition than this black one. The black yarn was handspun by my daughter Ellen, Shepherd’s Moon. Last weekend, I led a one-day knitting workshop in the lovely hills of eastern Ohio. I designed mittens for the occasion. Eleven knitters worked from the eight-page pattern leaflet. The child-size pair (left in photo) were knitted using Plymouth Encore worsted weight yarn and US #2 needles. The adult-size pair (right) were knitted using Brown Sheep Lamb’s Pride yarn and US #3 needles. 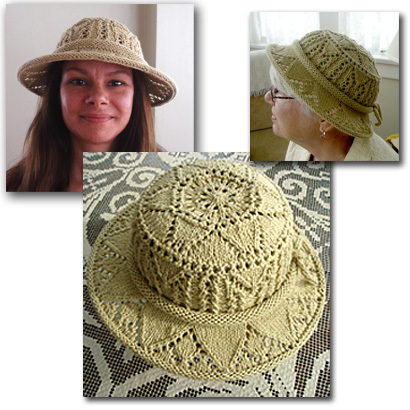 This pattern was designed for beginning through intermediate level knitters. Knitters could choose to knit a ribbed cuff in one color and focus upon the basic texture-stitch techniques, or knit a two-color, stranded cuff with a one color, textured hand. Connie King of the Pleasant Home Woolen Company organized the event with a delicious carry-in lunch. She also shared her home with me for the weekend—a delightful farm home with breath-taking views of the Ohio hill country. Thank you Connie. If raveling out almost as much as I knit qualifies me to facilitate knitting classes, then I’m over qualified. Sometimes I think I ravel more than I knit. You should see my box of learned-the-hard-way projects. Have you lost your place in a pattern so you can’t go on? Are you frustrated by a difficulty in your knitting? Do you need help with fitting, construction or some other dreaded task? These sessions are planned to help knitters solve challenges that are keeping them from finishing projects. Bring: A project, pattern, needles, and whatever else you’d need to ask questions and find solutions to specific problems. Learn the basics of gansey knitting. In her book, Knitting Ganseys, Beth Brown-Reinsel discusses the details that makes sweater construction identifiably Gansey — welts, plain area, definition ridge, patterning, seam stitches, gusset. This sock pattern includes all those features. The gusset for the heel is even worked like an underarm gusset, then turned with a short-row technique. Bring: DK-weight yarn (plain color and light enough to see a texture pattern), US Size 1 or 2 needles (5-needle sock set, two circulars or magic loop will all work), tapestry needle, scissors, stitch markers. This garter-stitch shawl features shaping so that it hangs comfortably, simple Russian-style lace accents, and double-ribbed closure. Learn the basics of chart reading, eyelet lace, short rows, increases and decreases. Bring: 750 yards of sock or sport weight yarn, US size 2 or 3 circular (or pair of long straight) needles, tapestry needle, scissors, stitch markers. This pattern was written in a child’s size so it could be completed in about 4 hours with the intent of providing practice in both texture and two-color (stranded) knitting. An adult size pattern will also be provided. Learn chart reading, two-color knitting, texture knitting, and shaping. Bring: Two colors of DK-weight yarn (a light color and a dark color), US Size 2 or 3 needles, tapestry needle, scissors, stitch markers. Brown Sheep Lamb’s Pride and US Size 3 needles will work for adult mittens. Learn long-tail cast on, increases, decreases, stranded color knitting, selvage preparation for seam, seam sewing, pattern and chart reading. This projects includes most of the basic knitting skills and produces four afghan squares that are sewn together. Bring: four colors of DK weight wool yarn: 1 ball green, 2 balls light neutral color, 1 ball dark and 1 ball light flower color. 5-needle sock set in size appropriate for yarn weight. 20-inch circular needle at least two sizes smaller than sock set. Don’t waste time learning the tricks of the trade. Remember the story about the blind men and the elephant? Each described only the part they could feel—be it the tail, trunk or leg. Writing about the summer trade show that The National Needlearts Association just hosted in Columbus, OH is like describing only part of an elephant. My highlights would be different than others. Andrea Wong taught classes and introduced her new book, Portuguese Style Knitting at the show. I helped in Helen Hamann’s booth and spent the day drooling over her colorful design and Alpaca yarns. I also took a couple of quick trips around the floor. Kramer Yarns of Nazareth, Pennsylvania caught my eye since I enjoy using their products. Durango Button Company of Broken Arrow, Oklahoma sparked my imagination as well. I think buttons can make or break a handmade garment. Not only were there endless varieties of yarn and needlework items, but notions, publications, and accessories were bountiful as well. I usually have little contact with the enterprise end of the needleart industry so this was an end-to-end learning experience for me.